I met a goat on the road today. He approached from the opposite direction, running at a steady but moderate pace—not a gallop but more of a trot. It seemed about the same speed as my car had reached, as fast as I felt like driving on a hot August morning when a faster speed would have generated billowing plumes of dust from the powder dry land. He ran in a straight line along the roadway, his intention of uninterrupted travel quite apparent in his demeanor. He needed to be somewhere. He was a small goat, not exactly a Nubian or Toggenberg but of some mixed breed, with a confidence attesting that in spite of his lesser size, he was most assuredly full grown. His foot-long horns flared from the top of his head up past his ears and off to each side of his black-marked face. The only other markings on his white body were on his legs, black from the knee down. His body held the features of a potent male, well-muscled in the chest and shoulders, his sides curved in health. We considered each other with curiosity as we slowed in meeting, a greeting and courtesy that, on reflection, I concede should not be limited to human travelers. His gold-flecked eyes came directly to mine, the black pupil slits narrowed against the sun already brilliant in the hot sky. It was not a hostile exchange, since I was quite willing for him to go on about his urgent business that called to him from somewhere to the west. For myself, I was already late for business to the east. His expression conveyed a world weary understanding that we all have places we must go, or return to, in the course of conducting our daily affairs. It was not immediately clear whether he was coming or going, but then neither was that really any of my concern. His gold-eyed appraisal was brief and to the point, whether I was someone he knew, whether I meant him any trouble, whether I had any rolled oats he might nibble before continuing on his way. In moments, he gained the answers to his queries and began to move on. Likewise, my glance carried questions. Was he seeking assistance? Was there any trouble? Was there anything I should do? No, it was clear nothing was required of me. His flat black nose lifted slightly, a nod of acknowledgment which I returned before thinking that I was, in fact, conversing with a goat. I eased my foot off the brake and the car rolled eastward, tires crunching on the hot gravel. He hurried on without a backward glance which I knew only because I gave a backward glance in my rearview mirror. I did not ponder whether a goat, like fabled dogs and a few cats, might travel to find a family that moved on without him, or whether, once moved to quarters not exactly to his likely, he might make his escape and return to his preferred location. Those were questions not to be answered unless I followed him. If I followed, as if examining a quark, I would have altered our original trajectories. I’m wondering if this is a common occurrence–have you ever met a goat on the road? One of twenty delightful essays about life on an Ozark hilltop, with watercolor illustrations. 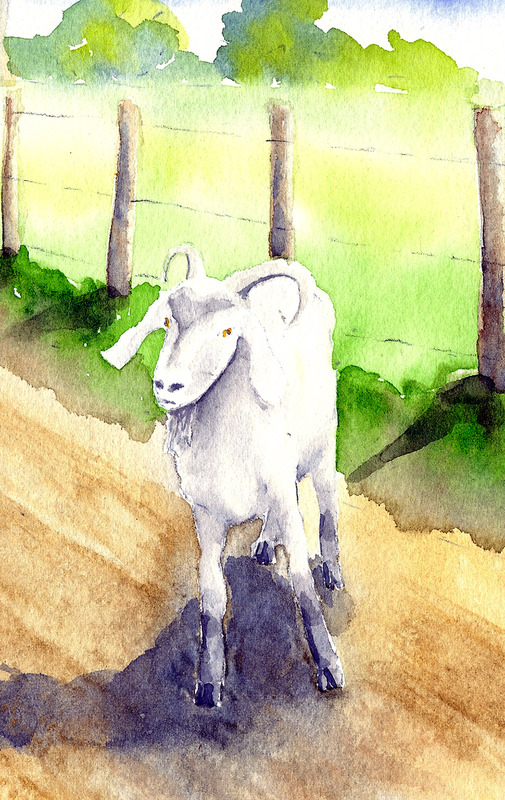 I Met A Goat On The Road: and other stories of life on this hill is available as e-book or in paperback. This entry was posted in Uncategorized and tagged author, chance encounter, essay, Goat, nonfiction, rural life, writer, writing on August 17, 2014 by Denele Campbell.